Next month millions of college students will graduate and enter the workforce. That’s great news because it provides recruiters like you and me with a new pool of talent to tap into. But recruiting them is merely half the battle, since they’re likely to change employers three times their first five years after graduating. Or so our Economist Guy Berger tells me. To measure job-hopping over time, we divided generations of workers into five year periods based on when they graduated college. For example, Generation X graduated between 1986-1990 and 1991-1995, and Millennials graduated between 2001-2005 and 2006-2010. 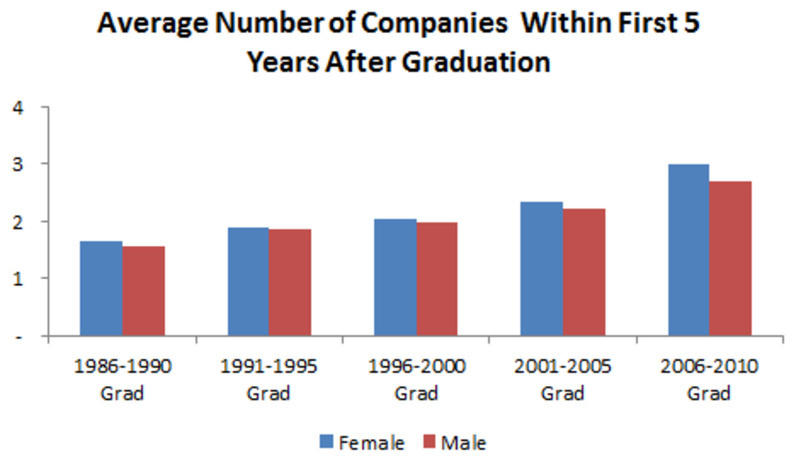 Between 1986 and 2010, the average number of companies professionals worked for in the five years after they graduated has nearly doubled. Professionals who graduated between 1986-1990 averaged 1.60 jobs during their first five years working, whereas those who graduated between 2006-2010 averaged 2.85 jobs. 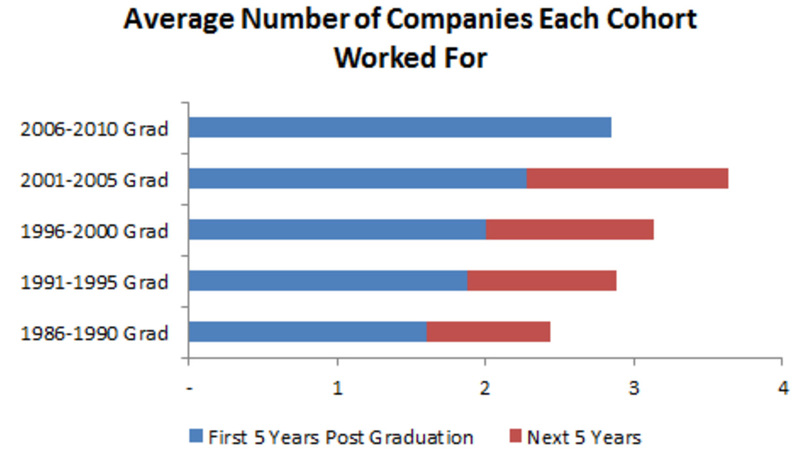 But will recent grads keep up the job-hopping pace five to 10 years into working? Nope! Every graduated group mellow outed over the course of their careers. Still, younger generations are likely to work for more companies in the second decade of their careers than previous generations did. Interestingly, professionals who ended up in the Media & Entertainment, Professional Services, and Government/Education/Non-Profits industries job-hopped the most the five years after they graduated. 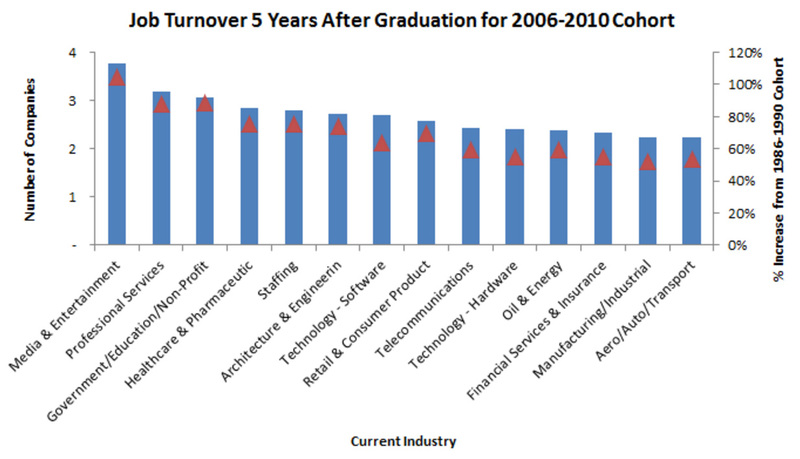 Whereas the Oil & Energy, Manufacturing/Industrial, and Aero/Auto/Transport industries are where the 2006-2010 grads group who job-hopped the least the five years after they graduated ended up. While job-hopping is common among both genders, women job-hop slightly more than men. The differences aren’t statistically significant, the gap is the widest we’ve seen to date among the most recent college grads (2006-2010). So what does this mean for you and other recruiters? Expose employees to lots of things -- At LinkedIn, we’re always looking for new ways to give employees exposure to different things. For example, each month employees spend one day focusing on themselves, the company, and the world. They can give back to the local community, develop relationships, or learn new things. We also have a Speaker Series where we invite interesting people to come in and speak to employees about an interesting topic. And we support various causes employees can get involved in, like Women in Technology. Offer training and development -- If employees aren’t learning something new, they’ll go elsewhere. So give them lots of options to develop new skills. The best part is that up-skilling your workers will not only help retain them, but it will also ensure that they’re skills are always aligned with your company’s needs. Empower employees to explore different jobs -- I know what you’re thinking… I didn’t hire them in one job just to give them another. But if you limit them to a single job, they’re more likely to jump ship sooner or later. At LinkedIn, we have a Business Leadership Program where sales associates rotate through multiple business units before taking on full-time roles within our Global Sales Organization. It’s a great way to give employees a taste of different jobs, and make them smarter about your overall business. These insights are courtesy of our Economist Guy Berger. If you’d like to see his latest and greatest insights, be sure to follow him on LinkedIn. For our basic unit of observation, we split college graduates in the United States since 1986 into 5 half-decade groups (1986-1990, 1991-1995, ... , 2006-2010). We used year of graduation with bachelor’s degree. We also restricted our sample to individuals who reported starting a job within one year of finishing college and have had LinkedIn activity within the past month. We did this to reduce the possibility that some older graduates may be omitting early work experiences from their LinkedIn profiles (maybe because they consider their early experiences less significant or not relevant to their current career goals) and to make sure we were only considering profiles that were most likely up to date.